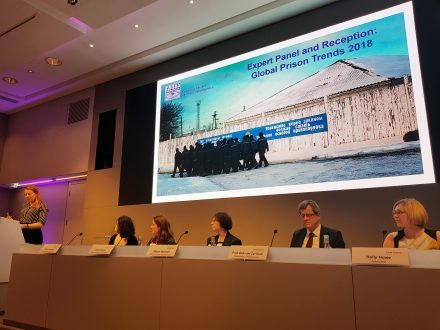 Yesterday, Penal Reform International hosted an expert panel event in London to mark the UK launch of Global Prison Trends 2018. Published last month, Global Prison Trends 2018 is the fourth edition in PRI’s annual flagship Global Prison Trends series. The panel event, which took place at Linklaters LLP, brought together experts to discuss the most urgent and emerging issues facing criminal justice systems worldwide. Jessie Ingle, Co-Chair of the Women@Linklaters network, opened the event, discussing Linklaters and PRI’s previous collaboration on women in criminal justice systems. Alison Hannah, PRI’s Executive Director, moderated the panel discussion. Olivia Rope, PRI’s Policy and Programme Manager, discussed 10 key trends from the report, as well as the 25 recommendations given for states to review and improve their penal systems, and the foreword written by the Rt Hon Helen Clark, Member of the Global Commission on Drug Policy and Former Prime Minister of New Zealand. Marie Nougier, Head of Research and Communications at the International Drug Policy Consortium, explored the rise of drugs and violence in prison. She explained how women who are incarcerated for drug offences are primarily non-violent, first-time offenders with a low level of education, and highlighted that 50 to 80 per cent of women in prison in Brazil, Costa Rica and Thailand are imprisoned for drug offences. Holly Howe, Legal Fellow at AdvocAid, Sierra Leone, talked about the rise of female prison populations, including the fact that most women in prison in Sierra Leone are imprisoned for petty crimes resulting from poverty, such as loitering and non-payment of debt. The closing speaker was Professor Dirk van Zyl Smit, Professor of Comparative and International Penal Law at the University of Nottingham, who presented his groundbreaking research on life imprisonment. He called for judges to have more discretion when sentencing, and highlighted the need for fair mechanisms and rules governing release. A drinks reception followed the panel discussion. PRI would like to thank Linklaters LLP for hosting the event.